The Imo State Governor, Rochas Okorocha has congratulated the candidate of All Progressives Grand Alliance (APGA) in the November 18th Anambra governorship election, Gov. Willie Obiano, over his re-election. 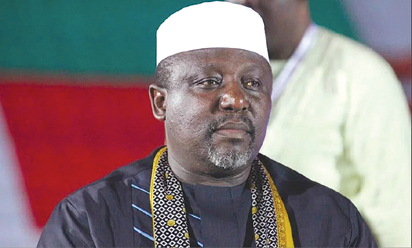 Okorocha gave the congratulatory message in a statement by his Chief Press Secretary, Mr Sam Onwuemedo, on Monday in Owerri. "The governor said that Obiano’s victory was too clear to be contested or questioned". He, therefore, advised candidates of other political parties who took part in the election to congratulate the winner and avoid going to court to question his victory. Okorocha, who is also the Chairman, All Progressives Congress (APC) Governors’ Forum, expressed regret over the loss of his party in the election. According to NAN, Rochas attributed the loss to internal wrangling and the lack of genuine commitment on the part of the party’s leadership in the state. He, however, expressed the hope that with the election, the future of APC in the South-East was bright. He said that before now, nobody would have thought that APC could do better in Anambra. The governor urged Nigerians to celebrate President Muhammadu Buhari and the APC led-government “for allowing level playing ground for all candidates. “The Anambra election shows that the APC has what it takes to strengthen the nation’s democracy.” Okorocha thanked the people of Anambra for the peaceful election and for not yielding to IPOB’s threats or listen to the group’s call for boycott.